Neck pain is a common medical condition and most of the adult population suffers from this problem at some point in time in their life. The neck pain may be due to improper habits/postures in our daily routine life, lackluster lifestyle, and misalignment in the spine, injury, stress, muscular tightness or any other health problems. Bad sleeping habits like sleeping on stomach (when you have to keep your head 90 degrees to side), using very thick or thin pillow, working long hours on desk/computer, viewing TV in awkward position or traveling for long hours in sitting position, improper/excess exercises or workouts, are the main causes of stiffness, soreness, cramp or neck pain. The neck is composed of vertebrae along with the ligaments that provide stability to the spine. It supports the entire weight of the head as well as provides mobility. However, because it is less protected than the rest of the spine, the neck can be vulnerable to injury and disorders that produce pain and restrict motion. Proper posture while sitting – keep your head and back straight. 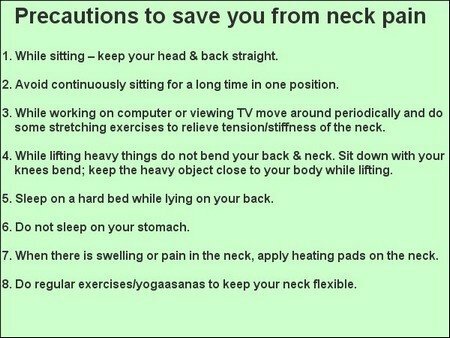 While working on the computer or viewing TV move around periodically and do some stretching exercises to relieve tension/stiffness of the neck. Avoid continuously sitting for a long time in one position. While lifting heavy things do not bend your back and neck. Sit down with your knees bent; keep the heavy object close to your body while lifting. Sleep on a hard bed while lying on your back. Do not sleep on your stomach. When there is swelling or pain in the neck apply heating pads on the neck. Do regular exercises/yoga asanas to keep your neck flexible. You may get relief in neck pain by doing following exercises if the pain is not due to any injury or other medical reasons. 1. Stretch your arms in front of you, parallel to the ground at shoulder height level and palms of both the hands should be facing the ground. Close the fists in such a way that your thumbs remain inside; rotate your fists in a clockwise direction. While rotating fists your hands should remain straight and may not bend at the elbow. Now rotate your fists in the anticlockwise direction and keep normal breathing. You should do these exercise 15-20 times from both the hands. 2. Place your both the hands on shoulders and join elbows in front of you and make big zero in the clockwise direction. While rotating your arm your elbows should touch each other with every rotation. Repeat this exercise in the anticlockwise direction. You should do at least ten rotations in both the directions with normal breathing. You can do these exercises in your office also while working on computers for a long time. 3. Raise your both the hands over your head and catch the right wrist with your left hand and left wrist with your right hand. Take a deep breath and pull the right hand with your left hand in such a way that elbow of your right hand should come behind your head. Now exhale and repeat this exercise from the left hand. 4. Interlock fingers of both the hands and place them behind your head. Take a deep breath and put pressure in opposite direction from hand to your head and from head to hand. It will strengthen the muscles of your upper spine.